The Gardens On Task user interface is clean and simple. 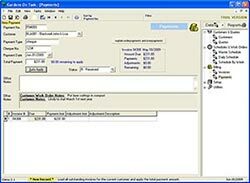 The main windows of the software are always one click away using the Task Tree on the right hand side. And the very standard Menu and Toolbar at the top gives you access to all the functions available for the currently open window. For any new customer the first step is create a new customer record. 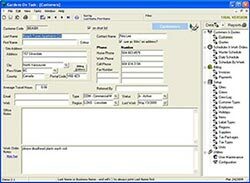 With the Customers data entry window open, click the New Customer button on the Toolbar to begin. You'll find fields for billing and site address, many phone number and e-mail address fields, and endless space for notes. And if you have a large customer base you will appreciate the Find Customer window which allows you to search for customers quickly in many different ways. With the Quotes data entry window open, click the New Quote button on the toolbar to begin creating a new quote. 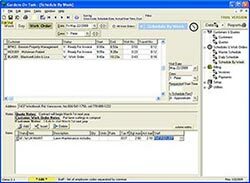 Then choose the customer, then add the work items to be performed including their prices and schedule, then save and print the quote. The quote can be as simple as a single visit to trim a hedge, or as complex as a year's worth of property management including special visits spring and fall. After creating and saving the new quote, click the Print button to launch the Print Quotes window. From there you can preview, print, or save the new quote to an Adobe Acrobat .PDF file for e-mailing to your customer. If you create a quote, scheduling of the work after the quote is accepted is as easy as setting the "Finalized" checkbox on the accepted quote. 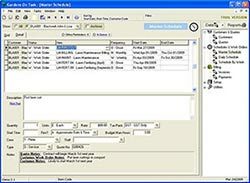 When you open the Master Schedule data entry window you will see all of the scheduled work details from the quote. If you don't need a quote, you can enter the new customer's work schedules directly into the Master Schedule. 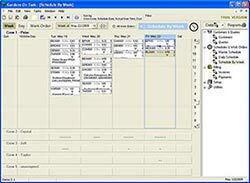 Open the Daily Schedule data entry window to view and edit all of the individual scheduled items for a customer. If a customer has weekly lawn maintenance, here you will see each of the scheduled visits for the entire year. This data entry window can be useful, but generally, the Schedule By Week window is better suited for manipulation of individual visits. Open the Schedule By Week data entry window to view and adjust your crew's work schedules one week at a time. Use drag and drop to move customer visits from one day to another, or from one crew to another. You can also use drag and drop to change the order of the visits. 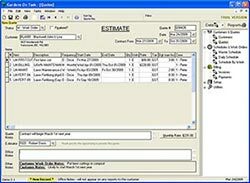 Using the Work Order tab you can edit the details of each individual visit such as work description, items to be performed, and estimated man hours required. Once you have your week organized you can print work orders for each day of the week for each crew. 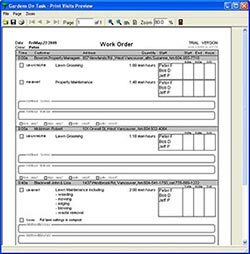 Work orders are printed from the Schedule By Week window by clicking the Print button on the toolbar. 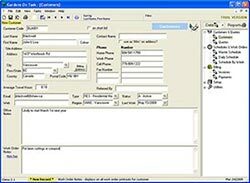 The work order includes details of each visit, including a checkbox for each task, and a place to fill in actual visit times. After the work is complete, hand written details from the work orders are entered into the Schedule By Week data entry window. Click on the "Work Order" button at the top left corner of the window to begin. Then enter billing details and actual hours for each customer visit. Additional services and materials can also be entered at this time. Actual Man Hours are only required if you wish to do future analysis comparing budget to actual hours. After the work is complete and the billing information has been updated, invoices are generated automatically. 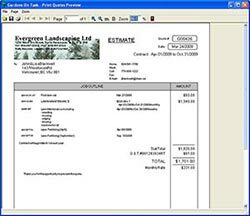 Open the Invoices data entry window, then click the New Invoice button on the toolbar. This will open a window allowing you to generate a batch of invoices including all outstanding scheduled work. Once the invoices are created they are available for viewing, editing and printing. After creating the new batch of invoices, click the Print button to launch the Print Invoices window. From there you can preview, print, or save the new invoices to Adobe Acrobat .PDF files for e-mailing to your customers. 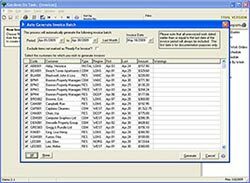 After creating your detailed customer invoices in Gardens On Task you will likely wish to update your accounting system. In most cases one simple Accounts Receivable entry per invoice is all that's required. 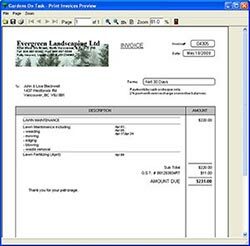 This entry should contain the Gardens On Task invoice number, customer, date, amount, and tax total. 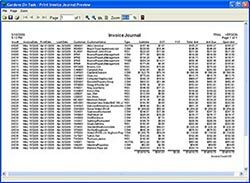 The Invoice Journal report in the Invoice Reports window can be useful to summarize the entries required. Use Payments data entry to process payments from your customers and apply them to specific invoices. For each payment simply select the customer, enter the amount of payment, then click "Auto Apply" to load outstanding invoices and apply the payment amount. This will update the Open Amount on each invoice. 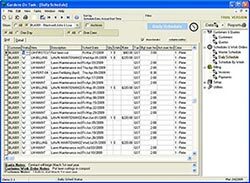 It also allows you to print an Aged Receivables report summarizing which invoices are outstanding and how long they have been outstanding. It also allows you to print a "Previous Charges" section on your invoices. Processing of payments in Gardens On Task is optional. You may choose to do this in a separate accounting system.